I think we’ve all heard that saying before without even giving a second thought as to why the thieves used it as the magic phrase to open the door to their lair. Well it turns out that the sesame seed that we use in cooking pops out of its pod when ripe, which is similar to the thieves wanting their door to pop open. The pod kinda explodes little seeds all over the place, which actually makes it hard to harvest, so the farmer has to harvest it right before that happens.And the sesame seed is what I want to talk about today. 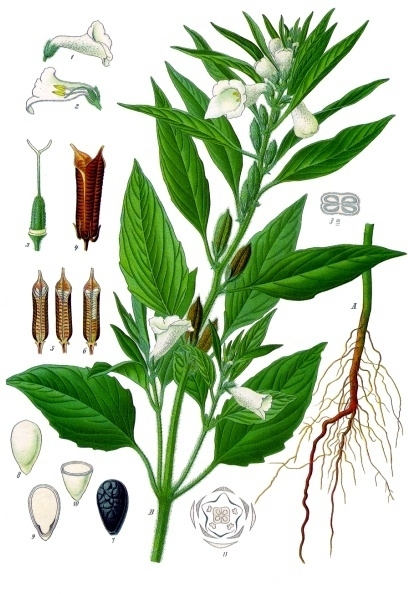 Sesame plant, seeds, roots etc. Source wikipedia. The sesame seed is an important part of the cuisine of many cultures, and the seeds and the oil are frequently used in Korean cooking. The sesame seed plant was probably domesticated in India more than 4,000 years ago. It is a tough plant that can survive and grow in harsh conditions and sometimes has the nickname of ‘survivor crop’ because it will grow where other plants cannot. From India the use of the plant as a food crop gradually spread outward, to Asia to the east, to the Middle East to the west, and through sea trade southwest to Africa. Nowadays it is commercially produced in many countries around the world as it is a billion dollar industry. India and China grow the most, although China also is one of the biggest importers, along with Japan. It turns out that China exports food grade sesame seeds but imports oil quality ones. Sesame seeds have a nutty flavor and a subtle crunch; they are also incredibly healthy for you. Sesame seeds are a good source of copper, calcium, phosphorus, magnesium, iron, zinc, B1, selenium, and more. The seeds can come in a variety of colors, like white, yellow, black, grey, and red. The color of the seeds can also be changed dependent on whether they are roasted or not. Koreans tend to like to extra roast the seeds so if you buy Japanese or unroasted sesame seeds you might want to roast them at home for your Korean recipes. The seeds can go rancid if stored too long so don’t use any that have a funky smell. Koreans also use sesame oil and sesame paste in their recipes. If you can’t find the sesame paste easily you can substitute tahini. It is a good idea to have both roasted sesame seeds and sesame oil in your pantry if you plan on doing much Korean cooking, they are staples in a lot of recipes. I only found white and black in my local grocery store, but plan to look for some of the other colors. The black seeds taste stronger and have a more complex flavor than the white. Cucumbers Seasoned with Sesame Seeds. Oi Bokkum Namul. A fairly quick and simple side dish that uses sesame seeds and sesame oil. You’ll need to find the little baby cucumbers, not pickling cucumbers because their skin is too thick. I was lucky and found these in my local grocery store, otherwise I would have used an English or hothouse cucumber. Wash, and dry 3 or 4 baby cucumbers with a paper towel, then top and tail them ,and then cut into slices. Put them in a bowl and sprinkle with salt. I use a mix of sea salt and pink Himalayan salt. I put a plate on top to cover them and slightly press them down to allow excess water to drain from them. After about 10 minutes gently squeeze out the excess water that has formed. Heat a frying or saute pan on medium and add 1 tablespoon of dark sesame oil. Add the cucumbers and stir fry for 2 or 3 minutes. Put them in a bowl and add 1 tablespoon of sesame seeds. I used a mix of black and white sesame seeds. Add some ground black pepper to taste, and check if it needs a little more salt. Put it into a storage container and when cool move to refrigerator. It will only be good for 2 or 3 days in the refrigerator so you can try adding it to a green salad or even in sandwiches to use it up. Enjoy. It was part of my dinner tonight. ← Korean Innovations: The Heated Greenhouse. I have two questions regarding this recipe. 1. Can I keep this refrigerated? If so, how long? 2. Do you have any dish recommendations to try this with? Hey Missa, thanks for the compliment. To answer your first question, yes you refrigerate it and for no longer than 3 days. This is a type of namul which basically means seasoned vegetables. So like any cut vegetables you don’t want to keep it too long before eating. It would go well with any type of Korean dish where you want something with a crunch and a somewhat mild taste as one of your side dishes. Tonight I had it with Bibimbap. Hope this helps and thanks for commenting. Have a great day.